When I tell people about what I get up to in my free time I normally get a reaction somewhere along the lines of “Wow, that sounds amazing, I wish I could do a triathlon” (or something similar involving my madness). 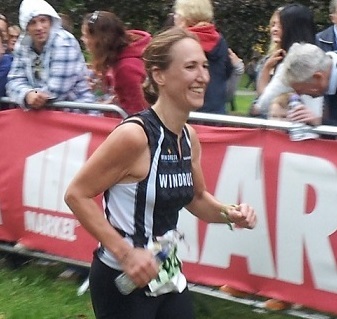 So with people still buoyed up with new years resolutions, and the deadline for booking races in before they sell out fast approaching, I thought it might be a good time to share my story of how I got into triathlon, and why I think you too can be amazing and CAN do a triathlon. I believe pretty much anyone can complete a marathon or triathlon (or whatever challenge takes their fancy). It’s just about mindset. A mind that says ‘that’s something I can do’, rather than ‘that’s something someone else does’. I certainly wasn’t in to sport at school, instead it was something to be endured. A time to look down at my shoes and try to look unbothered when I was in the last few to be picked for a team, a time to run up and down a pitch hoping to never be in a position where the ball might get passed in my direction. Fair enough, I’d always dreamed of running the London Marathon but it was a distant aspiration rather than something I could imagine actually doing. But then I met someone who had done a few marathons, and suddenly marathons stopped being something that ‘other people’ did and turned into something that a normal, real person I knew had done. And from there, after a lot of procrastination, into something I could actually imagine me doing. I entered the Great North Run (a half marathon). The training was hard work. I was pretty convinced that my body really wasn’t capable of running for longer than 20 minutes and even another 5 minutes was a struggle. But I kept at it. It definitely helped having a few friends who were into running, to keep me going – to occasionally run with and to ask stupid questions. And then the big day came. I won’t lie, it was really hard work. But I’ll never forget that shiver through my body as I realised that I was really doing it, I was running the race that I thought I’d never be able to do. And from there I went on and did my first full marathon, and another…. But much as I love running, doing it for almost 4 hours was not my idea of fun. And so I decided to give triathlon a go. Again, I was full of doubt about whether I would be able to do it, especially as I couldn’t swim front crawl. But then someone told me they’d just done their first triathlon in breast stroke, and again the distant idea began to turn into something I could imagine doing, and I decided to give it a go. I went to classes to learn crawl (freestyle). When I first started I literally couldn’t manage more than one length of the 15m pool before I needed to stop and recover. And I joined a club, where I got loads of support and advice. And I kept at it, and on the day of the race I remember I could not wipe the smile off my face. It was definitely hard work, but I was so proud of myself that I was actually doing it. And I was even enjoying it! So if you’re even half considering doing a triathlon (and I’m guessing you are if you’re reading this) then please give it a go. If you’re not feeling confident then go for a super sprint, pool based race. That way you don’t have to worry about open water and wetsuits, but you get to experience the full thing and see if it’s for you. You can find the nearest race over your chosen distance here and lots of tips for preparing for your first race here. One of the most beautiful but challenging runs. 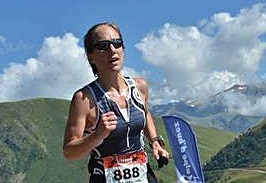 Hot on the heels of climbing the 21 legendary bends of Alpe d’Huez , an off road run at 2000m. Nervous about the swim? I’d still say go for a full triathlon and conquer your fears, but if you’re really not keen then there’s some great duathlons, or for non cyclists, check the aquathlons on the same page (non runners check for aquabikes, but there’s rather less choice I’m afraid). But stop thinking that triathlon is something that other people do, and become one of those people! Let me know how you get on, and if you’ve got any questions, or comments, please do post below. This entry was posted in cycling, first triathlon, Triathlon and tagged cycling, first triathlon, get fit, health, lose weight, positive thinking, Triathlon. Bookmark the permalink.